Imagine an electrically conductive material that can warp and stretch like a rubber band but immediately snap back without any damage. Such technology could pave the way for sensitive synthetic skin, wearable electronics, malleable microphones, and even new pacemakers that beat and flex with the heart. Stephanie Lacour, a key pioneer of stretchable electronics at Cambridge University in the United Kingdom, has designed an electrical circuit that “can be stretched 100 percent in one direction” without losing function, according to Barclay Morrison, her collaborator at Columbia University. Lacour, who was honored this September by the Massachusetts Institute of Technology for her work, is using the material to design a prosthetic “that would mimic your own skin,” so that a man who has lost his arm would one day not only be able to shave his face, but even be able to feel just how close a shave it was. Lacour found that by applying very thin gold ribbons, only nanometers thick, to an elastic substrate called poly-dimethyl siloxane (PMDS), she could create a pliant circuit. Gold itself is not supple, tending to break under minimal strain, and Lacour does not yet understand how its properties change when imbedded in the PMDS. However, she immediately recognized the discovery as an opportunity for innovation. Although the field of robotics has been rapidly providing amputees with mechanical prosthetics that accurately mimic the movement of lost limbs, engineers have not yet found a way to reproduce sensation. The only “skin” currently available for mechanical limbs serves a purely cosmetic function. Lacour envisions that her material could interact with the environment such that an amputee could wear as if it were his own skin. Two essential properties of human skin are its abilities to move with the body and to perceive pressure, according to Lacour. Every time we turn the page of a book, walk barefoot over a gravel road, or roll out a piecrust, we decode information about our surroundings. In a robotic arm or leg, this information would provide crucial feedback about its spatial position, allowing the device to adjust continuously to its environment. But the flexible electronics that are currently available are still too rigid and unable to integrate the information from pressure applied over wide areas. The gold filaments in Lacour’s system, acting as connectors between silicon transistors, may solve this problem. An experiment published by Lacour and Sigurd Wagner of Princeton University in the journal Applied Physics Letters describes how they used this technology to design a large-area pressure sensor. At task now is adapting the material so that it will be safe to use in the body since a key component of the material, chromium, is toxic to humans. Morrison, Lacour’s collaborator at Columbia, is modifying her design for use in biomedical experiments modeling brain trauma. Stretchable electronics provide him a way to study severe head trauma in real time. After growing brain tissue on the material, Morrison will contort it to simulate the damage resulting from a car accident or baseball bat to the head. Embedded microelectrodes will then give a read-out of the electrical properties of the tissue as it suffers damage. Morrison also sees potential for stretchy circuits to improve the design of electronic surgical implants. Hearing aids, pacemakers, and brain stimulators used to treat Parkinson’s Disease all require an interface between rigid electrodes and soft living tissue. The silicon in most microelectrode arrays “is one million times more rigid than the brain,” says Morrison. Because the body is in constant motion, friction can cause scarring at the points of connection, making the devices less effective over time. With a material that more closely resembles the flexibility of living tissue, Morrison expects that we will begin to see medical devices that function longer and more effectively. Although Lacour has focused her work on medical applications, she is extremely hopeful that it will impact fields far beyond her own. Lacour even imagines that airplane manufacturers will use the material to make flight readiness checks safer by creating an electronic sheath around an airplane’s wing that would continuously monitor the integrity of the structure. Researchers have been playing with slightly bendable electronics for a while, but with this material they believe they have an extraordinary new toy in their box. 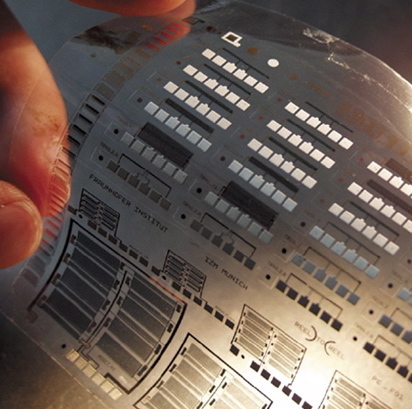 “That you can stretch metal and it remains conductive” is pretty amazing, Morrison says.